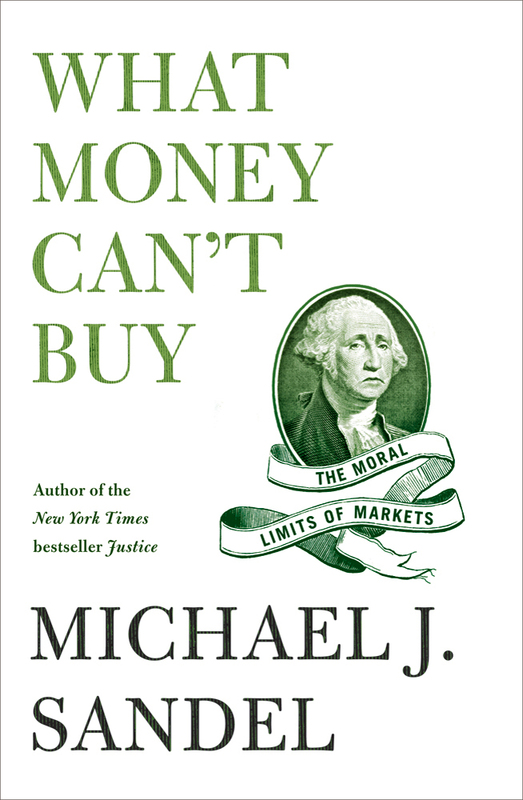 I wrote a post last Saturday, Skyboxification, taking off from a review by Jeremy Waldron of Michael Sandel’s recent book, What Money Can’t Buy: The Moral Limits of Markets. On finishing the post, I thought that maybe I should read the book. Sunday I downloaded it and today I finished it. Not hard to do, given how short the book is. It reads more like an extended essay. As Waldron pointed out, the book is loaded with examples in which money and markets have been introduced (or intrude) into parts of life that might better be kept free of them. This is what motivated me to turn to the book itself. Waldron discussed a handful of examples, all intriguing, and I was curious to see more. One family of examples has to do with fines becoming fees. A particular case to which Sandel returns from time to time is a daycare in Israel that decided to fine parents who were late to pick up their children. The surprise effect? Tardy pickups increased. Without fines, parents felt properly guilty about keeping the daycare staff at work after hours. With the introduction of fines, tardiness was monetized and parents stopped feeling guilty. They could simply pay for being late — or so one imagines they reasoned, consciously or unconsciously — and they were happy to do so. How the staff felt is another matter. Or what about gift cards? Giving someone a gift shows thought, interest, a connection. Sandel reviews arguments from economists that giving cash would be better, since the recipient can make better use of the money. But this doesn’t feel right to many. Are gift cards different? Apparently so. The gift card business has been booming. What’s up with that? The idea of selling admission is open to two objections. One is about fairness; the other is about corruption. The fairness objection says that admitting children of wealthy donors in exchange for a handsome donation to the college fund is unfair to applicants who lacked the good judgment to be born to affluent parents. This objection views a college education as a source of opportunity and access, and worries that giving an edge to children of the wealthy perpetuates social and economic inequality. The corruption argument is about institutional integrity. This objection points out that higher education not only equips students for remunerative jobs; it also embodies certain ideals — the pursuit of truth, the promotion of scholarly and scientific excellence, the advancement of humane teaching and learning, the cultivation of civic virtue. … allowing fund-raising needs to predominate runs the risk of distorting these ends and corrupting the norms that give universities their reason for being. This is one case where perhaps the appeal to fairness is more compelling than the appeal to corruption. But what about developing a futures market on terrorism: a gambling site where people can place bets on terrorist attacks on certain targets? The logic for suggesting this, as the Defense department’s research organization DARPA did a few years ago, is that such a market would provide useful intelligence. Yet, betting on death makes many people queasy. Sandel devotes an entire chapter to death bets, with numerous examples, including basic life insurance, which was outlawed in many cultures for centuries. The phrase is ascribed to the Roman emperor Vespasian (ruled 69-79 CE). Vespasian imposed a Urine Tax (Latin: vectigal urinae) on the distribution of urine from public urinals in Rome’s Cloaca Maxima (great sewer) system. (The Roman lower classes urinated into pots which were emptied into cesspools.) The urine collected from public urinals was sold as an ingredient for several chemical processes. It was used in tanning, and also by launderers as a source of ammonia to clean and whiten woollen togas. The buyers of the urine paid the tax. The phrase Pecunia non olet is still used today to say that the value of money is not tainted by its origins. My never-finished post was inspired in part* by a NYT article on the transformation of MIT’s campus by top architects. Working my way through an accompanying slide show, I came upon the David H. Koch Institute for Integrative Cancer Research. Yes, that David Koch, the libertarian multibillionaire whose political contributions have propped up the Tea Party movement and had a corrosive effect on our politics. (See Jane Mayer’s New Yorker article from two years ago for background on the Koch brothers.) Koch’s name is also on the former New York State Theater in Lincoln Center, home to the New York City Ballet. *I need to credit my son, Joel, for further inspiration for the still-to-be-written post. He introduced me to the Latin phrase in a different context. Which gets us back to naming rights. A deal with the devil? Dirty money? Or just good economic sense? I’m not talking specifically about the MIT and Lincoln Center buildings to which Koch has contributed generously. Rather, I’m raising the question in general. You must have your favorite example of a building you wish had its traditional name, or at least some name that wasn’t changing every few years as companies go out of business, are sold, or fail to keep their end of a naming deal. (Remember Enron Field, the original name of the Houston Astros’ home when it opened in 2000? No doubt millions of people first heard of Enron thanks to this naming deal. The name didn’t last. The field is now Minute Maid Park.) Sandel asks us not to decry this trend, or applaud it, but instead to think through what a suitable basis would be for objecting to monetization. He offers guidance, leaving us to engage in the process ourselves. In closing, Sandel returns to sports stadiums, which have not only commercial names attached, but also skyboxes and frightful ticket prices. Like him, I remember the days just a few decades ago when all tickets were affordable. 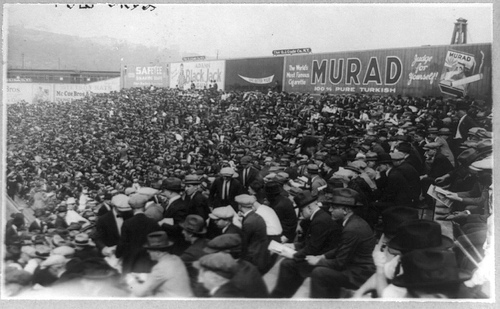 He writes about the modest pricing of tickets for Minnesota Twins baseball games. In the early 1970s, when I was a student, I would buy Celtics tickets just before game time at Boston’s North Station. They never sold out. You could just walk up to the counter a few minutes before the game, next to the train ticket windows, and pay $2, $3, $4, $5, or $6. (I sure wish I splurged for those $6 tickets just once.) Now that seems like a dream. need to ask a bigger question, about the kind of society in which we wish to live. As naming rights and municipal marketing appropriate the common world, they diminish its public character. … commercialism erodes commonality. The more things money can buy, the fewer the occasions when people from different walks of life encounter one another. We see this when we go to a baseball game and gaze up at the skyboxes, or down from them, as the case may be. The disappearance of the class-mixing experience once found at the ballpark represents a loss not only for those looking up but for those looking down. Something similar has been happening throughout our society. At a time of rising inequality, the marketization of everything means that people of affluence and people of modest means lead increasingly separate lives. We live and work and shop and play in different places. Our children go to different schools. You might call it the skyboxification of American life. It’s not good for democracy, nor is it a satisfying way to live. Democracy does not require perfect equality, but it does require that citizens share in a common life. What matters is that people of different backgrounds and social positions encounter one another, and bump up against one another, in the course of everyday life. For this is how we learn to negotiate and abide our differences, and how we come to care for the common good. And so, in the end, the question of markets is really a question about how we want to live together. Do we want a society where everything is up for sale? Or are there certain moral and civic goods that markets do not honor and money cannot buy? **But why must Sandel make it a point to tell us that all these people are his friends? For example, he co-taught a course at Harvard with Larry Summers in 2005, and they were “joined for some sessions by my friend Thomas Friedman,” Summers having already been described in the text as a friend. And on occasion, “my friend Richard Posner … has joined me … for debates about the moral limits of markets.” Should I point out that I was once friends with Summers’ future wife? Really, I was. But so what?